Welcome to Gainesville! 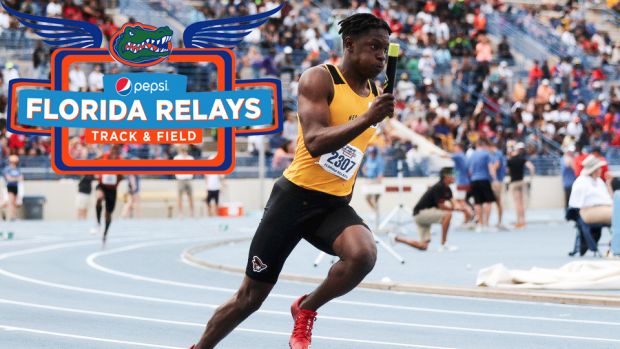 The 2019 Pepsi Florida Relays are hours away. With excitement for this weekend's competition we break down everything you need to know to prepare for the weekend. From performance lists, parking instructions, weather reports, to places to celebrate post-competition, and Sunday long run routes for any of you distance folk, we go through it all. Make sure to follow @flrunners on Twitter and Facebook, as well as @flmilesplit on Instagram to stay on top of all the action! Numbers need to be worn on the front of uniform for all events, except pole vault. Check in is at NW corner of track, 1 hour prior. ALL RACES WILL BE HEATED AFTER CHECK-IN. Weather is looking great for the weekend! Unlike last year, we have a weather report of sun and no rain! Expect it to be cooler 50s in the morning and get pretty warm by the afternoon. Sunblock, hats, and lots of water recommended. Head to Ben Hill Griffin Stadium to get some cool photos for the weekend. Stay awhile in the shade, it's one of the most peaceful places on campus. Need to get out of the sun? UF has two museums located less than a mile away from Percy Beard. Best of all it's free and educational. Located less than a half mile away from the track, Lake Alice is a staple for relaxation on the UF campus. Bring your Eno hammock and chill out in the shade to prepare for your next race. Best part? At sundown, Lake Alice is across from a few bat houses where thousands of bats leave for a night of action. Its a sight to see before you leave! Want to feel like a UF student for the day? Head to Plaza of Americas in the heart of campus. The great weather and nice grassy areas will be perfect to sit and relax and get a feel for Gator nation. Need a Sunday Long Run Route? Gainesville has some great locations to go and get a nice Sunday long run for all you distance runners! Here are a few favorites from our editor, Adair Lyden. Depot Park: Located nearby the campus, Depot Park connects to the Hawthorne trail -- a nice paved long trail -- perfect for an out and back long run. San Felasco Hammock: For the adventurous trail runners, the Hammock, is a great place to explore. If you're prone to getting lost on trails, the Florida Track Club hosts a 7:30 Sunday Run at the 11101 Millhopper Rd trail head. They have many experts in the Hammock Trails and multiple pace groups so you can be sure to be safe while on the trails. Gainesville is growing and you are sure to find a great place to eat off Archer Road. If you want to explore other parts of Gainesville and even get a feel for the town with some local places to eat, here are a few we recommend. Lunch: Steamers - a great little outdoor place in downtown Gainesville will be the best place to get curry or fried rice! Dinner: The Top - the wait is well worth it here. If you're vegan or vegetarian, The Top has so many options for all diets and is one of the coolest little places in downtown Gainesville.